H&N photo by Jill Aho - Don Kirby, the superintendent at the Intermountain Research and Extension Center in Tulelake, inspects mint plants growing inside a greenhouse at the center gathered from local farmers. He is studying the optimal time to harvest mint. The still at the University of California Intermountain Research and Extension Center in Tulelake is quiet. Tiny mint plants dot the soil in the field and scent the air in the greenhouse. 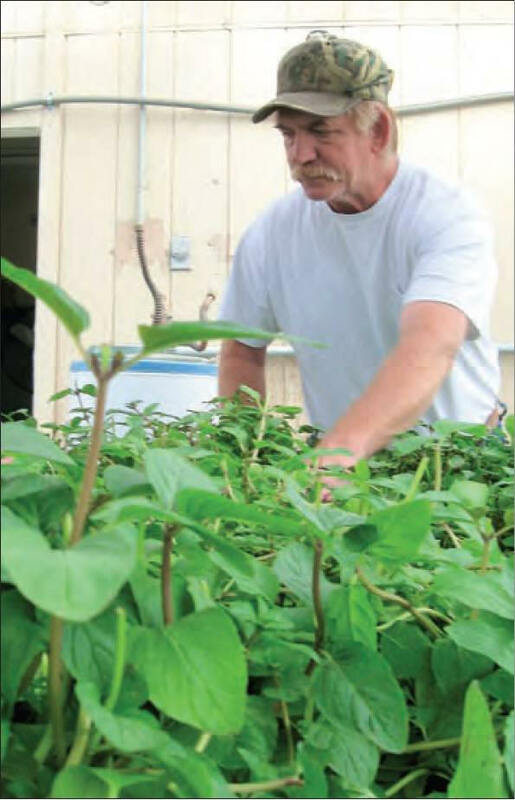 But in a few months, the miniature mint distiller the research station purchased with the help of area farmers will help extension center Superintendent Don Kirby with his ongoing project. Kirby is trying to determine the best time for farmers to harvest their mint crops, to maximize both quality and yield. Kirby visits farmers’ fields about three weeks before they intend to harvest and begins sampling. He then takes his samples back to the mint distiller to extract the mint oil. His goal is to give producers an idea of what is going on in their fields. “This is a very educated group of growers and aggressive growers, and you have to stay on your toes to stay ahead of them,” Kirby said. The extension center focuses its research on crops grown in the Klamath Basin and tries to find solutions to problems area farmers are experiencing in the field. Most Basin mint growers raise Black Mitcham, so that’s what the research center is growing, too. It also has a small amount of B-90, Kirby said. Kirby’s experiment in mint distillation is about five years old, he said. “Maturity varies from field to field,” he said. Based on the type and amounts of fertilizer and water regimen of the individual farmer, each mint crop is unique. Mint grows well in the Basin, but as more acres are dedicated, more problems have arisen. Intermountain Research Extension Center Farm Adviser Rob Wilson said about 4,000 acres are growing in northeast California, 2,500 of those in the Basin. Fluctuations in winter temperatures, which create alternate freezing and thawing conditions in the soil, have caused problems with mint crops. As the plants’ roots are exposed to the winter air, they become susceptible to frost, Kirby said. “It’s been a problem where we’ve lost a lot of stand,” Kirby said. Once mint is planted, it acts as a perennial, coming back year after year. Stand refers to the recurring plants. Mint also has some serious pest problems, including mites and root borers, which the station is also researching. But the appeal of the mint grown in the Basin is undeniable. And Kirby’s work will help the Basin keep that reputation and ensure our toothpastes, chewing gum and mouthwashes continue to taste minty-fresh.